The Swiss defenseman was named the club’s 13th captain in their forty year team history. He has been with the Islanders for three years but has only played in two of them. A shoulder injury forced Mark to miss the entire 2010-2011 season. When playing, Streit has been the Islander’s shut down defenseman, leading the team in ice time both seasons. With 56 points, Streit led the Islanders in that category in 2008-2009. Streit was a very good choice to become the Islander’s team captain. 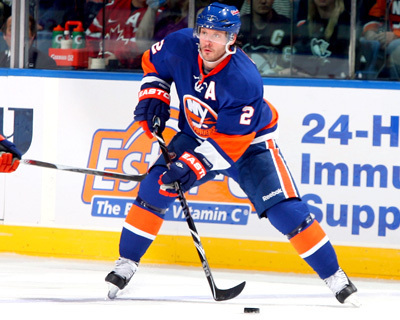 At 33 years old, he has been through a lot of different situations and will be able to help the young core of John Tavares, Josh Bailey, and Kyle Okposo mature into great players. He has Stanley Cup playoffs, Olympic, and World Championship experience and is dedicated to the Islander’s system. Only time can tell if Mark Streit will be able to lead the Islanders back to the playoffs for the first time since 2006-2007. This entry was posted in News, Trades, & Signings and tagged Garth Snow, Mark Streit, New York Islanders. Bookmark the permalink.